It was such a gloriously sunny day today (a nice change from all that rain)--but very very cold. While I was burning up the rubber in my stamp room, the heater was burning up the gas keeping me nice and toasty. But I LOVE it...I can't wait until we start getting snow. When it's cooler like this, I feel like I have boundless energy, I sleep better and I can just accomplish the world. So I made THREE Halloween cards today! WOW...the only reason I stopped was because my back was starting to hurt (and well, I was down there for about 5 hours and I was getting dizzy from lack of food!) 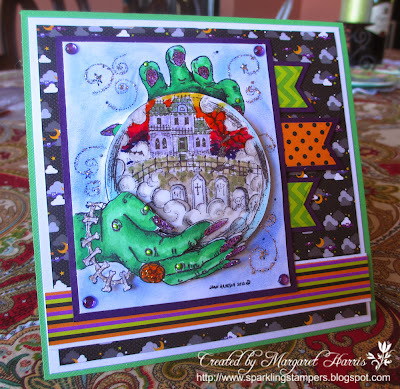 I've pretty much almost decimated my Doodlebug Halloween paper pad--I've loved this paper so much! I was tempted to get another pad yesterday at the store but then I figured, next year they will have something even better. Best of all, I'm so jazzed to be using my abundant Halloween stash. The card I'm posting today is a Northwoods stamp I got last year. I will be honest in that I was a bit daunted about using it because it is so detailed. But I challenged myself. Northwoods stamps always look so nice once they're done up. Then I had this idea to pop it out and make the crystal ball look shiny. I found the perfect sketch..Pals Paper Arts (PPA173) to inspire me. ALthough my image is just a tad too big for the sketch, I think it still works. I cut out the crystal ball, and laquered it (see closeup) and then cut out the hand holding it. I put some liquid pearly on the warts to make them pop up. 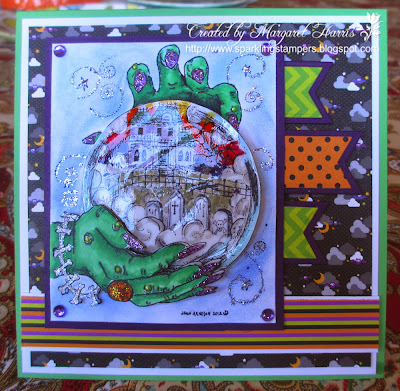 And of course it wouldn't be a Margaret card if it wasn't slathered with stickles (on her nails) and swirls and ring. I must say, this took a really long time to make, but I'm really pleased with how it turned out. Inside I stamped a Northwoods sentiment "I've got my eye on you". So cute! I was going to give it to my daughter Julia for her Halloween card this year, but decided to send it to a little girl who is turning 10 soon...she will think it's really spooky and will get a total kick out of it. Margaret, this is truly art! Thanks for joining us at the Pals Paper Arts this week. I LOVE this card...if it wasn't already spoken for, I would ask for it! Gotta love those green hands! I've never seen this stamp before...it is soooo cool! Fabulous job! Margaret, your card is amazing! I don't think I've ever seen such detail! So glad you shared with us this week at Pals Paper Arts! Wow! A true work of art...it's fabulous. Well done! Thanks for joining us this week at Pals Paper Arts! I hope you play along with us again. Wow Love this card! Those sparkly fingernails are far out! Thanks for sharing!